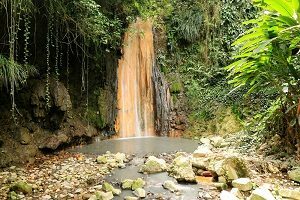 The Sulfur Springs is one of the top tourists destinations on the island of St. Lucia. This has been a prime location for celebrities and locals alike in search of the heralded benefits of the soothing mud baths. Any visit to St. Lucia can be a enjoyable experience, but a tour with Dave Charles Taxi and Tours will provide you with an experience like none other! The Sulfur Springs are the byproduct of an enormous collapse in the volcanic crust. This collapse upheaved an impressive load of lava, sheeting the surrounding surface in volcanic ash. What could have initially been considered a natural disaster has transformed into a national hotspot, literally! The water at the center of the springs boil at a steaming 340 degrees Fahrenheit, causing clouds of steam to rise from the earth. The Soufriere Volcano has not erupted in over 200 years, allowing the Sulphur Springs to be the island’s only drive-thru volcano. Journey a couple hundred yards downstream and you’ll find the ultimate attraction, mud baths! The water temperature can reach up to 110 degrees fahrenheit but is still warm enough for tourists to take a dip and enjoy the storied benefits of these relaxing baths. The many minerals in the baths are notorious for their incredible skin benefits. Some people claim that these very mud baths have healed their eczema, sun burns, and even sore joints. The saying has it that you’ll leave St. Lucia 12 years younger than you came. After you’ve lathered your body in the miracle mud, you can now enjoy a relaxing shower in the rainforest. Climbing 50 feet into the air are cliffs that send cool water down rushing down your body. The force of the waterfalls won’t knock you over but will provide a much needed neck and back massage after your long day of voyaging. For an unforgettable tour of the Sulphur Springs, look no further than Dave Charles Taxi and Tours! Call us at 1-758-715-3573 or use our form online to book your custom island adventure!